Syrian government forces on Thursday retook a key town on the outskirts of the capital Damascus after a months-long battle against rebels, a military source and state television said. “The army, with the cooperation of the National Defence Forces (militia), has accomplished its mission of restoring stability and security to Mleiha,” the army command said in a statement. “This is a tough blow to the takfiri terrorists who have begun to fall in the face of the successive blows dealt to them by the army,” it said. 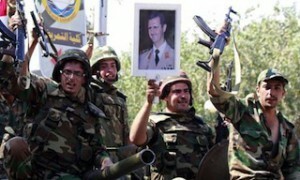 The chief of Syria’s air defence forces, General Hussein Isaac, was killed in fighting there in May. “Taking back Mleiha would allow the regime to protect parts of Damascus from rebel rocket fire on the capital,” Observatory director Rami Abdel Rahman said. “It is also the gateway to Eastern Ghouta,” he added. Elsewhere in Syria, the Observatory said Islamic State jihadists had beheaded at least nine opposition fighters on Wednesday night in Akhatarin, after seizing several northern villages. They had been hiding in “civilian homes” in Raqa, the Observatory said. IS grew from Al-Qaeda’s one-time Iraqi branch and originally fought alongside Syria’s rebel groups, but it has been denounced by Al-Qaeda’s leader and other opposition groups have turned against it.